Stuff the logo, I want that gmt/Worldtimer. Finally a proper one instead of the weird blingy world map one. As for the power reserve, just centre justify the logo and I am in too! Cannot believe they have a central logo and still left justify it. It looks odd, off balance and makes me go cross eyed when looking at it. Well I have had a quick look at the images in this thread. It was a case of "that looks quite nice, oh wait, something's not right". It was that logo again. Makes the dial so unbalanced imo. Can anyone give me a heads up if the faux luxury was explained? st-rider wrote: Well I have had a quick look at the images in this thread. I don't believe faux luxury was explained BUT it never was 'faux luxury'. The original quote was 'faux elements'. st-rider wrote: ...Can anyone give me a heads up if the faux luxury was explained? No, it was faux luxury. From the May edition of WatchPro magazine (not the luxury report 2016, the other May one). Interview with Mike France. Mike also used the phrase "faux luxury" in the telephone interview. So I suspect it's his take on the term that we've all latched onto, whereas CW as a company has put out other statements involving "faux". You got me there , although I'm sure I've seen reference to 'faux elements' somewhere recently. I guess its a matter of translation / interpretation Why don't we just refer to 'faux'? Overall, I agree the reference to faux anything was undesirable. Moving on . . . . . Yes, shutting down the faux & not proper comments now we've heard all we are likely to get from the powers that be. I enjoyed the chat last night. Quite agree that the post mortem over the website, branding etc. was not covered in as much depth as some would have liked; perhaps a case of going over old ground and closing the gate after the horse has bolted, plus I feel that CW and team wanted to move onto new stuff. It certainly seems that the changes are here to stay, whether we like them or not, and there was a statement from Chris that the new logo / branding is here to stay for good. Time will tell. 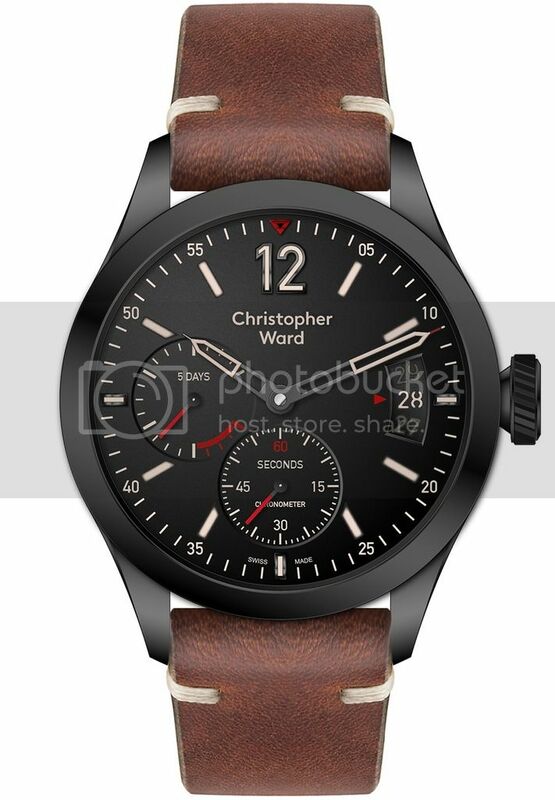 Very much like the teasers and details of the new C8 Flyer SH21, which is my preference vs. the Worldtimer/GMT although the price difference of £1.5K vs. £1K may come into play if I decide to go looking at that level. The C8 gets my preference presently being SH21. @smegwina - considering the logo position on the C8 SH21: I beleive that with the size / position of the sub-dials, to have the logo @ 12 but left justified is correct, as it fills what will otherwise be blank space in the 12-3 quadrant that would occur if you have it centred and centre justified @ 12; plus this would crowd up against the Power Reserve sub-dial. If that makes sense. I think Guy has summed up the chat with Chris well in the previous post. Fair play to the management team for facing up to the 50 or so forumites who had some tough questions. Most of the gripes were pretty much glossed over but I think that's what you'd expect. They've made a tough decision to re-brand and are not going to change course now. 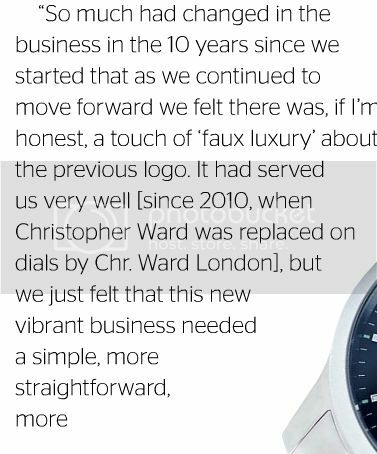 FWIW as a very recent CW convert, I was actually semi convinced that the new logo may look ok on certain watches, based on the previews they gave out...notably the world timer which looks superb to me, the logo seems to go well with that design. I'd probably buy that watch if it was on sale now...and I had the money. At times the team did sound like they had been brainwashed by the PR/design agency (Hello?) who had been commissioned with coming up with the new logo, talking about it having the same font as the London Underground and other design tosh like that, however Chris did mention having a brand/logo that would be better understood by the Chinese so clearly there is a strategy to expand sales into the newer economies China, India etc as a high end brand and they are probably right that the new logo may be clearer than Chr. Ward or CW etc. The above is all just my personal opinion of course and yours may differ but I am going to wait and see some more of the new watches before passing judgement. If the quality of the product, the value for money and the personal/customer service standards that you have all valued can be maintained then maybe most existing customers will continue to support the brand and possibly grow to tolerate/love the new logo in the future. Chris did think all the web site glitches & broken links were fixed and was surprised they weren't...well they are still evident now...e.g. the strap sizing guide still doesn't work...so still a few issues to resolve there. Yes, I would have expected the glitches to be fixed by now given multiple warnings of issues, it's a bit like Selfridges having a number of their shop display windows whitewashed over - unattractive & potentially expensive. I was a bit frustrated some issues were glossed over, but it's their business so their choice. Customers will make their decision. Interesting increase in "Average Order Value" since the new web site went live. That's a positive (assuming it's not people buying old stock while they can) and shows the forum probably doesn't represent your average CW punter. I really like the new UTC model, though I'm still not sold on the logo. I'll wait and see. The detail going into the movement and caseback is very interesting. I still think I'd prefer it with the logo centre justified. Oooh, now that is soooooooooo much better.